Railway Budget gives the direction to which way life line of Indians will drive in next fiscal year. Let’s analyze Railway Budget 2014-15: Bitter pill but forward looking! Indian Railway, one of the largest rail networks in the world, is always used by our politicians since independence to get political mileage rather than economic benefit. To win popular support, during every budget, politicians kept on announcing new trains, railway lines and other projects without touching the fares. This led to the little spare funds with the railways for its development works. The latest budget, which was presented by the newly elected Bhartiya Janta Party (BJP) government on July 8, 2014, up to some extent had succeeded in healing the bleeding railways. Since the railway fares were virtually left unchanged for almost a decade, the largest departmental enterprise of the country is left with little resources. The loss from moving one passenger to one kilometre has increased from 10 Paisa in 2000-01 to 23 paisa in 2012-13. With surplus revenue declining, railways have left with hardly any revenue for development works. The new budget therefore announced to rationalise the cost and revenue set up of railways with fare and tariff hike to recover additional revenue of about Rs 8,000 crore. It also proposed leveraging Railway Public Sector Units (PSU) resources by bringing in the investible surplus funds in infrastructure projects of Railways. Another important decision announced during budget was announcing foreign direct investment (FDI) in railway infrastructure projects. FDI in railway invited widespread protests from different quarters specially opposition political parties. However, the fact of the matter is that railway needs Rs 5 lakh crore for completion of ongoing projects and current surplus would not be sufficient from any standards. For fresh projects, it needs more resources and roping in foreign and private capital seems good idea. Foreign capital will not just bring investible money but may also bring technology know how and new ideas. Infrastructure is the most important aspect in any growth strategy. As a boost to railway infrastructure, railway minister announced Diamond Quadrilateral Project which will connect metropolitan cities with the high speed trains. 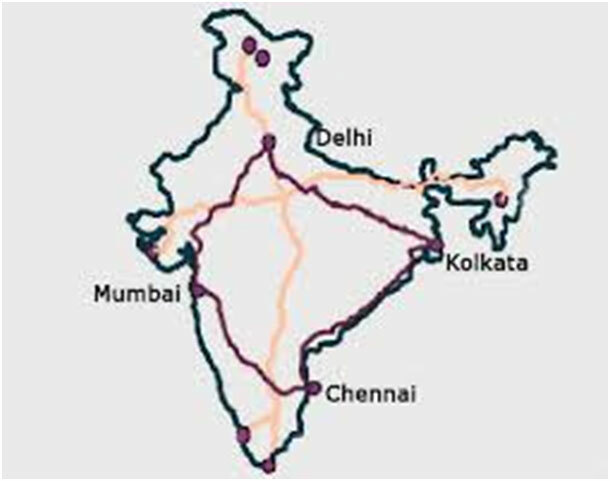 Initial studies have been done for Pune-Mumbai-Ahmadabad and Delhi-Chandigarh-Amritsar corridors. The total length of tracks under the project is estimated to be between 6,500-7,000 kilometres. For the funding of this project, government needs INR 9.0 Lakhs crores. This high cost is the primary reason erstwhile government shelved the project. Not just India, several countries including the United States abandoned the bullet-train project due to the cost involved. However, the role of railways in Indian transport is not comparable to that of the United States as in US, proportion of road and air transport is considerably higher than railways. In India, railways, the most popular mode of public transport needed to be reformed. We need to decongest the over-utilized routes and reduce the travel time. To meet that objective modernization of railways is imminent. During his budget speech, Railway Minister conceptualized a vision to make Railways the largest freight carrier in the world and dedicated freight corridors (DFC) will help in achieving that vision. The dedicated freight corridors in the east (Howrah-Delhi) and west (Mumbai-Delhi) were announced in previous budgets while the latest budget announced Mumbai-Bangalore corridor. East (Howrah-Delhi) and west (Mumbai-Delhi) are crucial for railways to capture market share. The shift of freight traffic to the DFC can open up the possibility of introducing more passenger services on the existing routes. Moreover, on West DFC, it will reduce the travel time from 30-40 hours to 20-24 hours for goods trains. On the entire western corridor, only 10% of freight traffic will remain if DFC is commissioned in 2017. Any measure which reduces time and money will help in increasing the share of railways in increasing the freight traffic. Apart from the aforesaid measures, it was also announced to improve e-ticketing system, Wi-Fi in A1 and A category stations and in select trains, internet-based platform and unreserved tickets, extension of logistics support to various e-Commerce Companies, etc. It can be summarised that the latest budget laid stress on improving the quality of services rather than announcing new services and projects. If the government succeeds in implementing what it announced in its budget, Indian Railway will most likely get transformed in the next few years.